The book "What's the Matter with Kansas?" was also written on this topic and uses the concept of "backlash-conservatism" as an explanation of as to why worker vote against their economic self interests. However, is this claim of lower income workers actually accurate and if so, does it apply on a regional basis or can it realistically be extrapolated out to make generalizations about the entire country? In short, no. It is a journalistic misunderstanding based on naive interpretations of statistics. 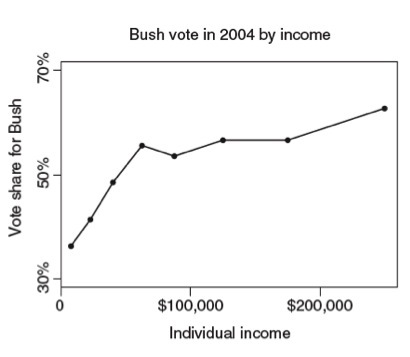 The idea that the working poor tend to vote republican seems to be based on a misinterpretation of the sort of statistics presented in the chart below (which shows state-level comparison of the republican share in 2004 with state-level average income). There is a clear pattern of richer states having a lower republican share of the vote; to express this differently: richer states tend to vote democrat. It is all too easy to leap from this to assuming poor people vote republican. The charts here are from a presentation by Andrew Gelman, a professor of statistics and political science at Columbia University. The presentation summarises some analysis from his book on the subject, Red State, Blue State, Rich State, Poor State: Why Americans Vote the Way They Do. He also regularly blogs on related topics, frequently debuunking statistical errors that have appeared in the press and media. 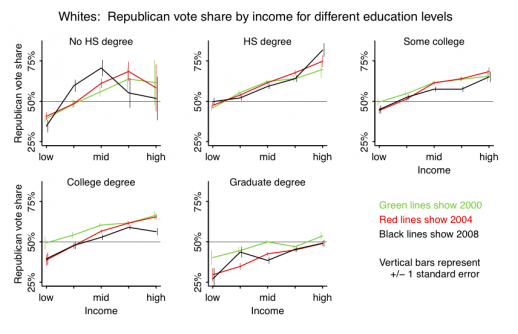 This chart also hints at one of the complexities of american voting patterns: the general trend for the poor to be more democrat is universal, but the extent to which the rich and poor differ in their preferences changes greatly by region. Census and opinion poll data since 1952 reveal that higher-income voters continue to support the Republicans in presidential elections. 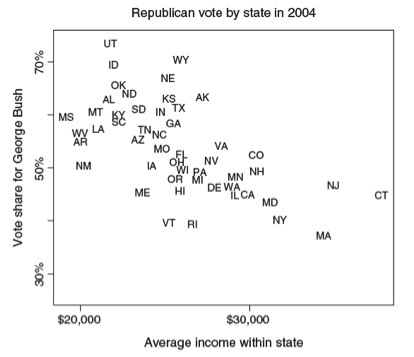 However, higher-income states have in recent years favored the Democrats. The Republicans have the support of the richer voters within any given state but have more overall support in the poorer states. Thus, the identification of rich states with rich voters, or more generally, the “personification” of so-called red and blue states, is misleading. In short the original claim is based on a common statistical error (often called the "ecological fallacy") where the aggregate pattern for states is mistaken for the pattern for individuals. In the HS degree or some college graphics, lower income is about 50/50. In poor states, poor people vote Democrat and wealthy people vote Republican. The same is true in a medium-income state, though less so than in the poor state. In the wealthy state, however, income has very little effect on voting: both the rich and the poor vote Democrat and Republican. Are teacher salaries lower in high-need (low-income) school districts? 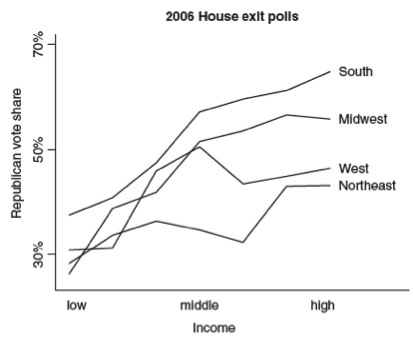 Is voter turnout inversely correlated with Republican success? Do Republican legislatures tend to relax gun laws after mass shootings? Earned income tax credit 25% fraud?